It is our grandson’s seventh birthday today! I do miss not being home to celebrate it with him. I forgot to mention the surprise we had yesterday morning. We were still in bed, with our balcony door open to enjoy the ocean breezes and the view, when we were shocked to see workmen standing on our balcony! Remember, we are in a penthouse apartment on the seventh floor! Turns out they are painting the building. There was a bit of paint smell yesterday but we thought they would be finished and we could put up with it for one day. 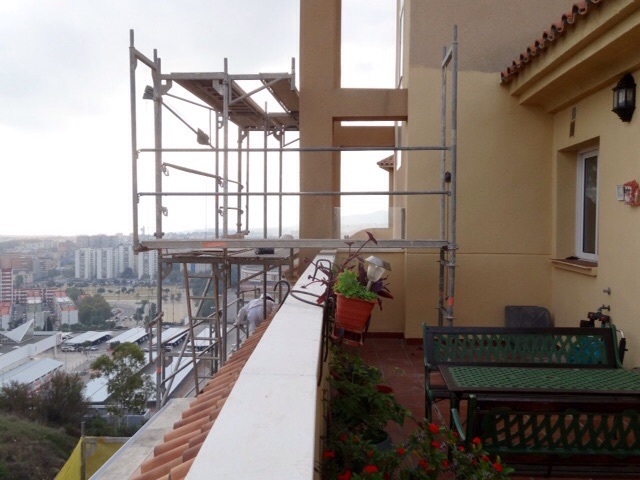 Well, today we discover they are putting up more scaffolding, for more painting…. 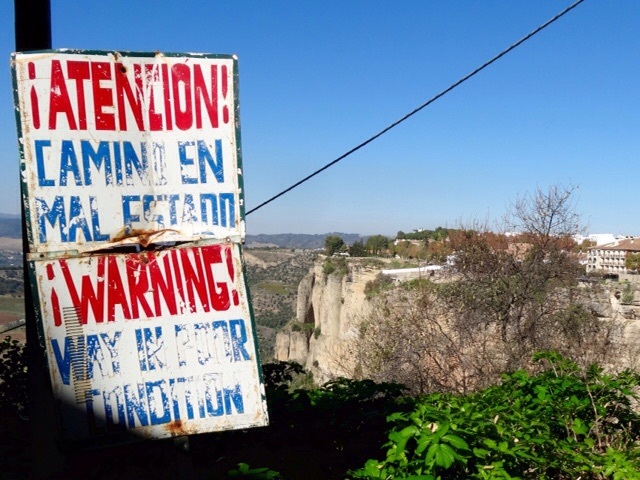 We contact the owner to see what is going on and plan a day trip to Ronda. 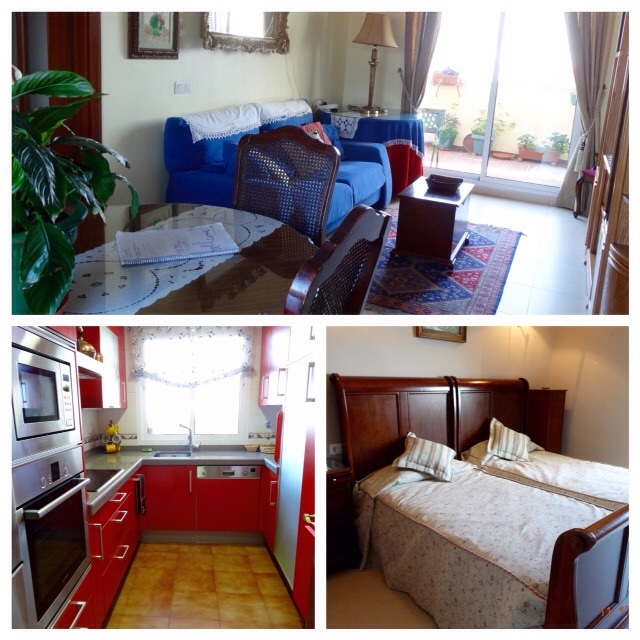 The apartment is very nice otherwise. 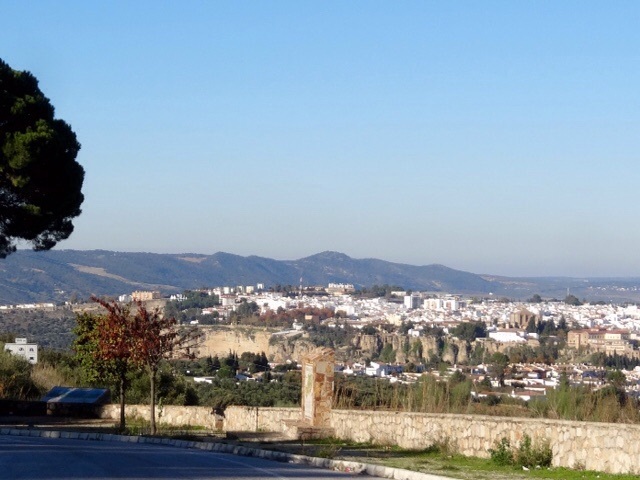 Ronda is one of the Pueblos Blanco, or White Villages that is located about an hour from our Airbnb apartment in Algeciras. 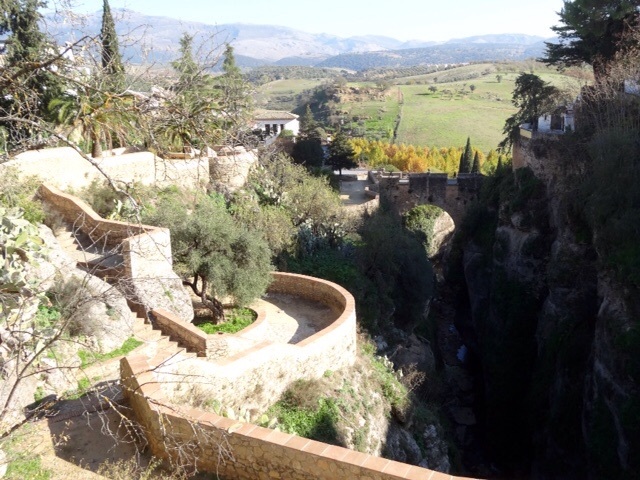 The white villages are fortified hilltop towns and villages that are whitewashed in the Moorish tradition. 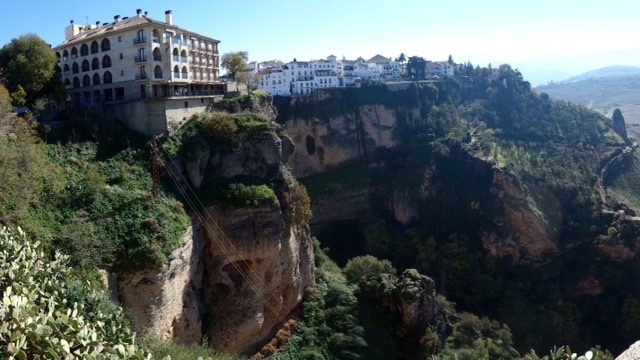 Ronda sits on a massive rocky cliff and it straddles a deep limestone gorge. 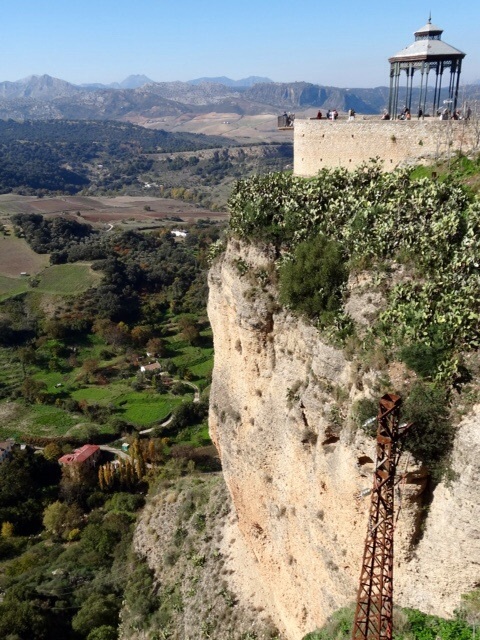 Because it was so heavily fortified and difficult to attack it was one of the last Moorish towns to fall to the Christians in 1485. It is still hard to realize that all this was happening before Columbus even set sail to discover the Americas! There is just so much history here. 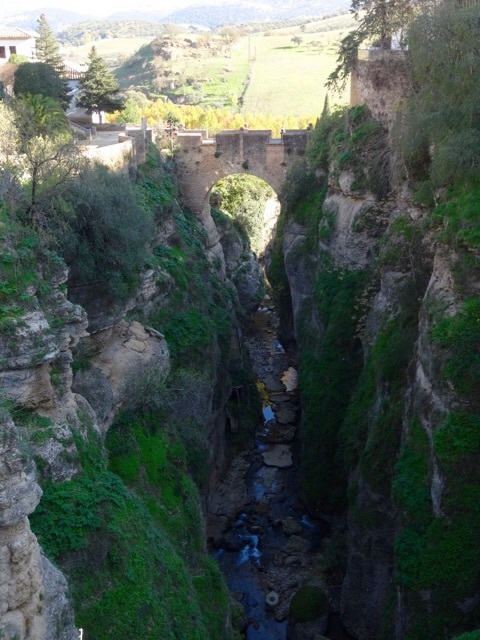 Ronda’s bullring is one of the oldest and most important bullrings in Spain, built in 1785. 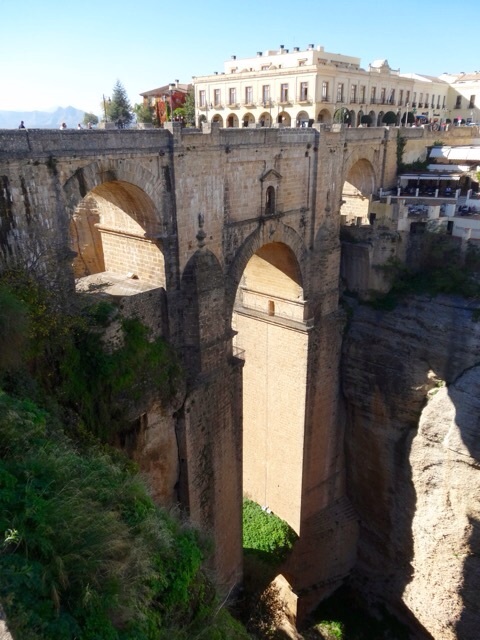 The dream of every matador is to fight here at Ronda. 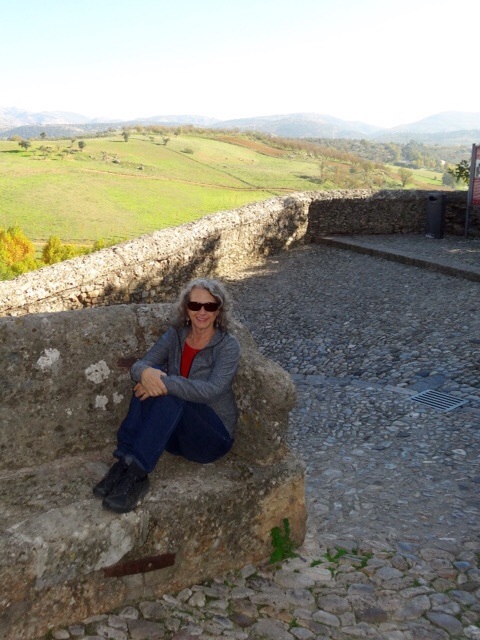 We sit and have our lunch near the bullring, overlooking this valley below the town. 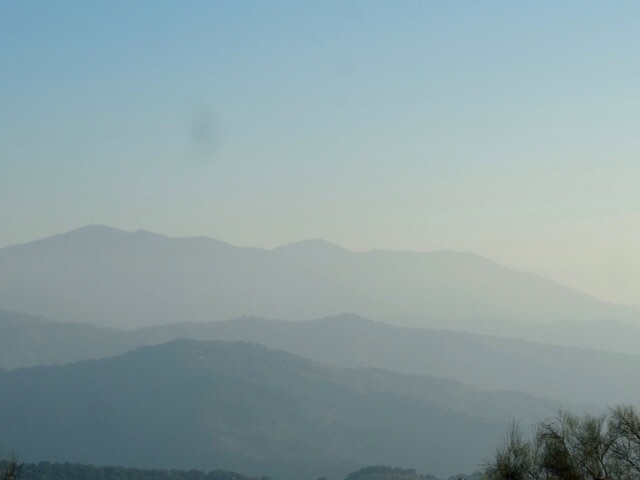 Then we wander along the cliff top and stop at a view point to take a few photos. A bit further along at another viewpoint I am a bit horrified to realize we were standing on a balcony like affair hanging out over the gorge. Look closely and you will see this liitle balcony. It doesn’t look very sturdy to me! The Puente Neuvo, or the New Bridge, was built in the 18th Century, and connects the newer part of town to the oldest area of town. We walk across it, and of course stop for even more photos. 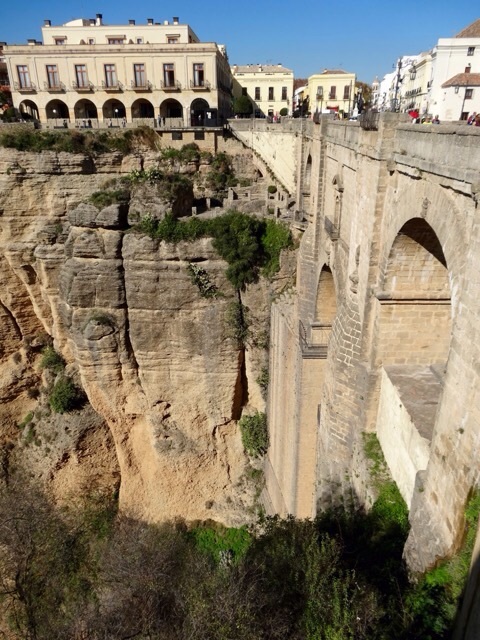 It is an amazing bridge, 120 meters above the river below. There is a stone staircase of 231 steps down to the river in the Gorge. I was trying to convince Bob that we should walk down but once we saw this sign we changed our minds. 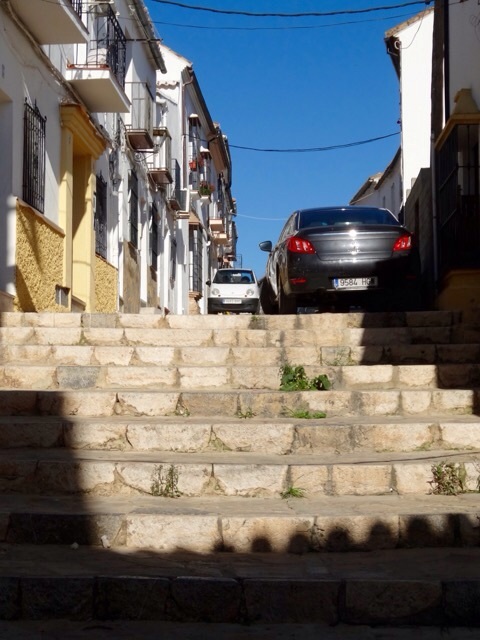 Instead we walk through the old town, popping in and out of the shops to see what we might discover and then head out to find the Puente Viego, or the Old Bridge which was built in 1616. Today it is a pedestrian bridge and I stop to sit on “The Moor’s Armchair” right in the crook of the hairpin turn on the road to the bridge. My camera has been giving me problems this entire trip. There is dust inside it that causes the spot visible in the sky in this picture and sometimes the settings just start jumping around and changing all on their own! One time it started taking every picture in triplicate! I am hoping it will keep working until the end of this trip. Any suggestions for a good camera? I think I will need to buy myself one for Christmas when I get home. 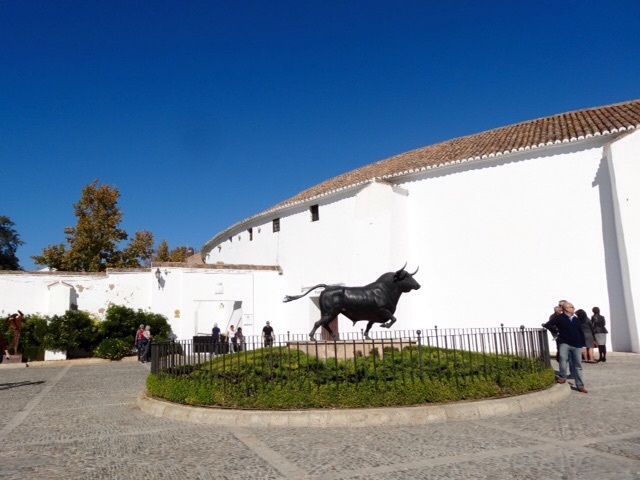 Life Drawing Class, El Rastro Market and a Bullfight! I went to Carmen La Greiga’s studio this morning. Carmen instructs and the class had a ‘Edvard Munch’ theme so our drawing assignments were related to that. Most of the instruction was in Spanish although Carmen translated for me quite often. Sometimes I wasn’t sure exactly what was wanted so then I just did my own thing. Combining three poses into one composition. Bob went off on his own to explore the Real Madrid Soccer Stadium while I was at my class, but the admission lines were very long, so he came back to meet me after my class, which was actually much longer than I expected. Carmen does a very nice critique of each person’s work at the end of class and that took over an hour. Bob and I met up in a little park near the Prado, I ate a very late lunch and we decided we would head home early for a change. 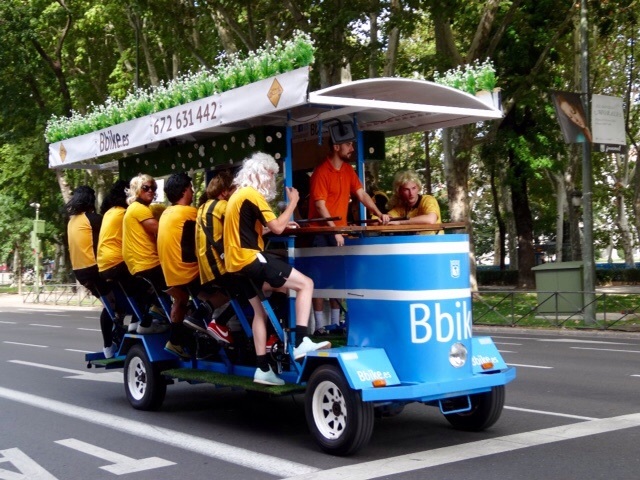 Funny, we both saw this strange vehicle today, the riders peddle sideways but it goes forward, and then there were those blonde wigs? No idea what it was all about. 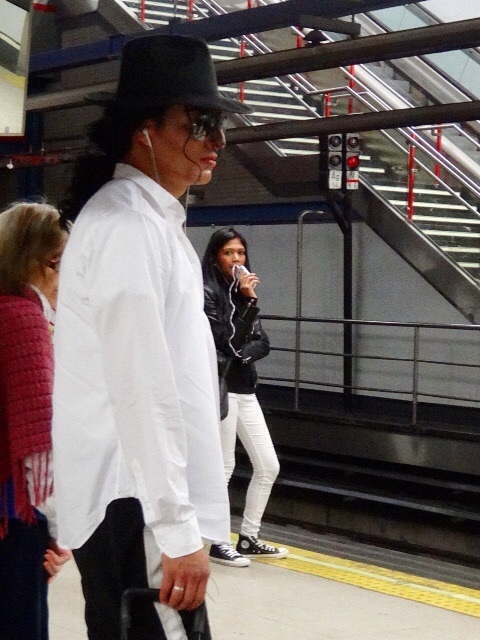 On the metro I spotted this Michael Jackson wanna-be, complete with make up and a white glove tucked into his belt. I do love the metro, such great people watching! 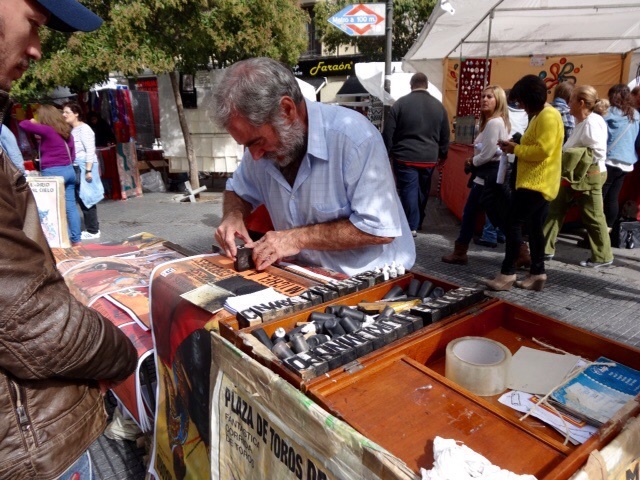 El Restro is a famous Madrid flea market whose origins date back to Medieval times. It takes place every Sunday so that is our first stop today. The streets are teeming with people everywhere we look. 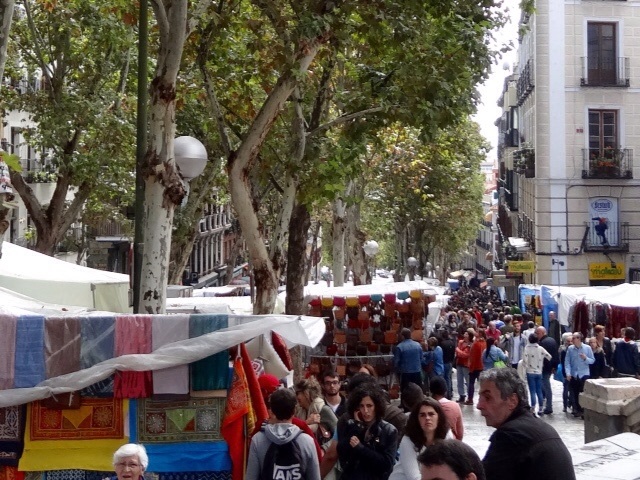 The market stretches for blocks with booths set up on both sides and sometimes even the middle of the streets. We wander and enjoy the sights, sounds and smells and even do a little souvenir shopping of our own. 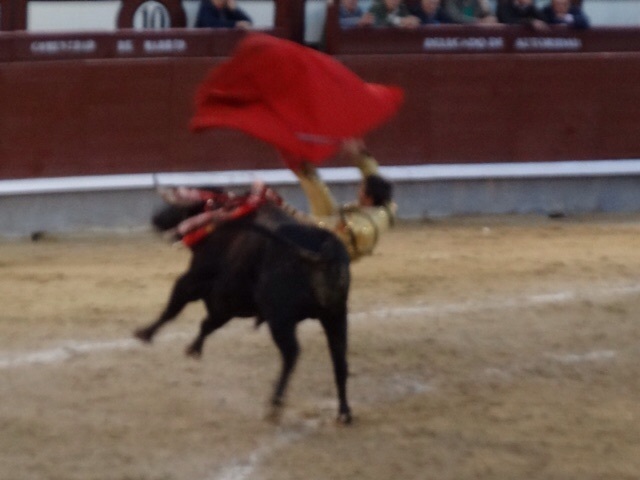 You can have a bull fighting poster with your name as the matador printed as you wait. 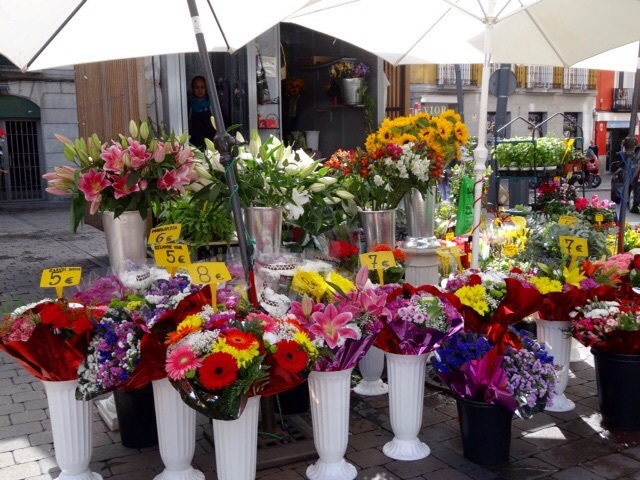 We had lunch near the flower vendors and then headed off to Plaza Mayor, a popular gathering spot in Madrid. The Plaza ( which by the way is pronounced platha, there are lots of ‘th ‘sounds in Spanish, gracias is actually pronounced grathius!) is packed with people and street vendors and has interesting buildings around it, but half of them are covered with scafolding right now. We find an information booth and we are told we need to head to the Bull Fight Arena right away if we want to get tickets. 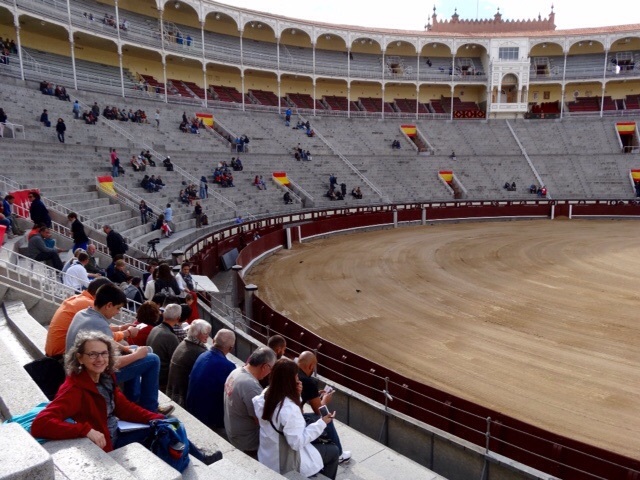 So a quick metro ride and soon we are at Plaza de Toros and the Las Ventas Bulll Ring. 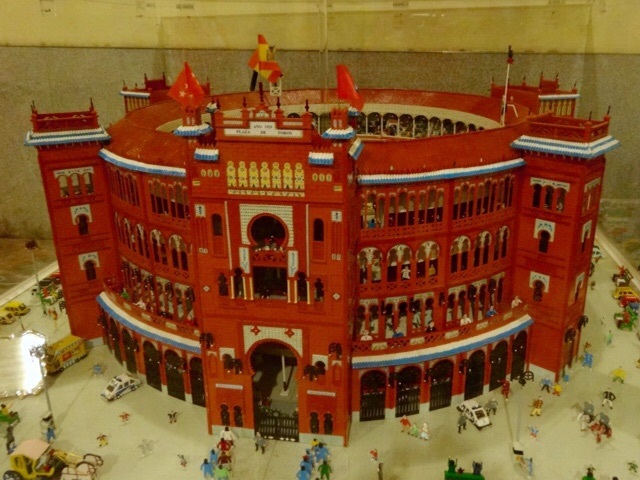 Here is a scale model of the arena. 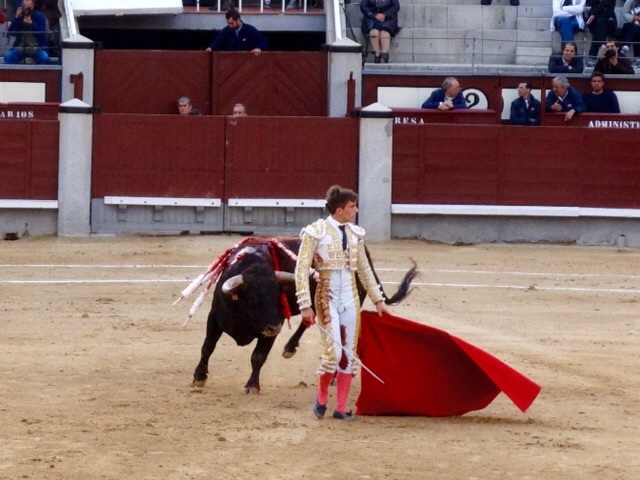 Yes, we are going to see a bullfight! I have mixed feelings about this but we have decided that it is something we should do at least once while we are in Spain. The tickets are very reasonable, only 12.60€ each gets us tickets in the fourth row. We were asked if we wanted first row tickets but I didn’t think I wanted to be quite that close to the action! Bob looks up Los Novilleros, which is the event for today and Google Translate comes back with ‘chopped heifer’. We hope that something was lost in the translation! Soon enough the spectacle begins. The banderilleros warm up, practicing their flourishes and moves with their capes. I am surprised that they are not red. Turns out only the Novilleros or Matadores have red capes. The Picadores enter the rings on their very large horses. They are draft horses as they are large and strong enough to withstand the bulls’s charge. 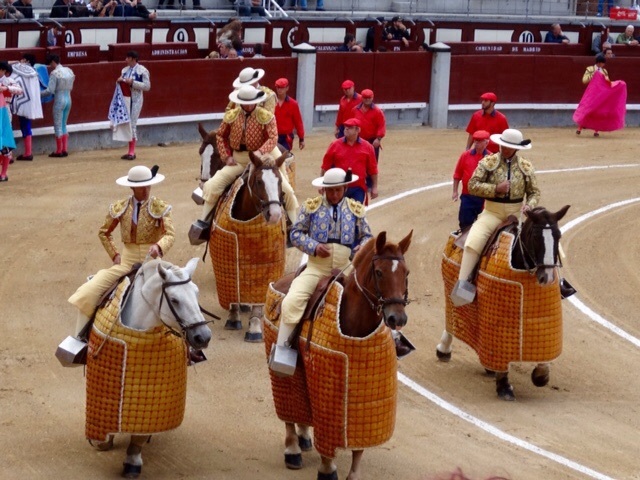 We are surprised to see that the horses are actually blindfolded during the bullfights. There are definitely things I don’t like about all this. 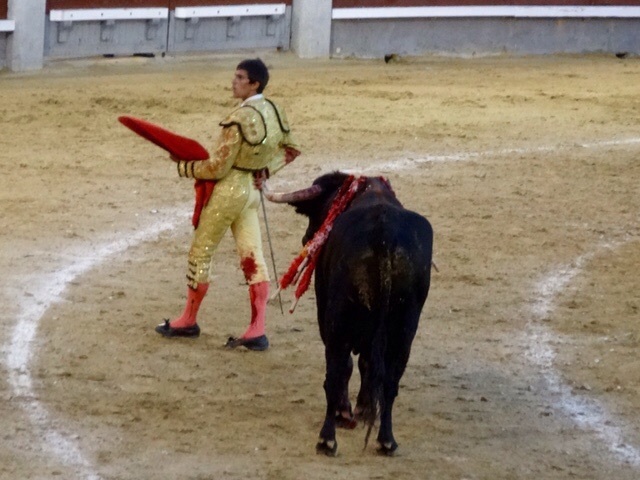 There are three Novilleros fighting today, these are bullfighters that are still in training as I find out later, and they are fighting bulls who are not aggressive or fierce enough to become ‘toros’. These bulls are three years old, not five and the young men fighting today are all 22 years old! I take a lot of pictures, about three hundred! I think that helped keep me at a bit of a distance from it all. Looking through the camera seemed to blunt the reality of what was happening in front of us. Much of the action was in fact right in front of where we were sitting. I am very glad we decided against the first row seats! There are some tough parts. 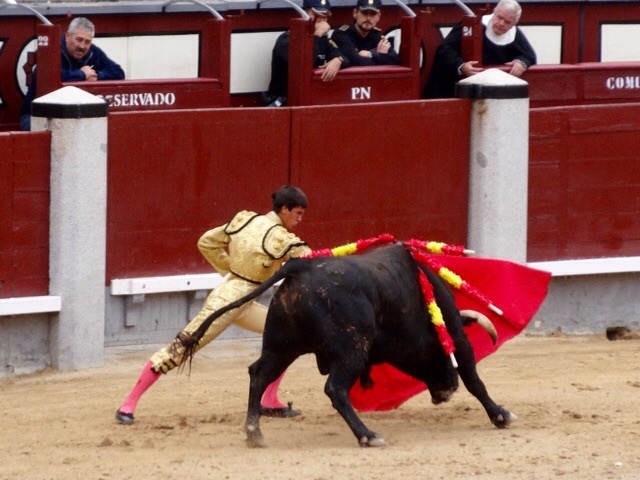 There is definitely blood, and one of the bulls sank to his knees and had to be coaxed to his feet for the final few passes and the Estocada, which is a final quick sword thrust between the bull’s shoulders and through the heart. If done correctly it results in a quick clean death. 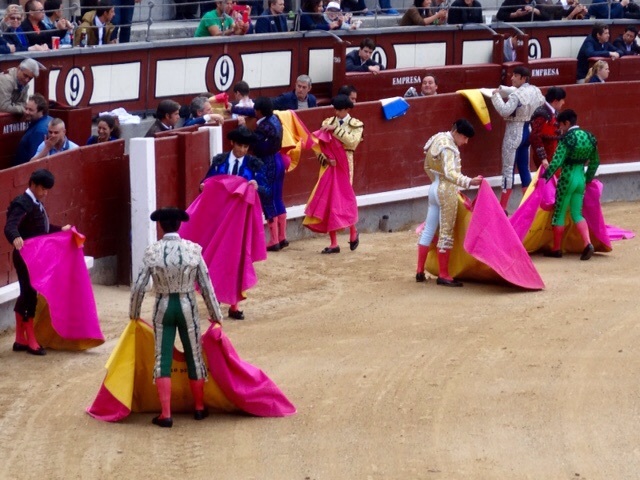 However, remember these are matadors in training so it wasn’t always quite so quick. 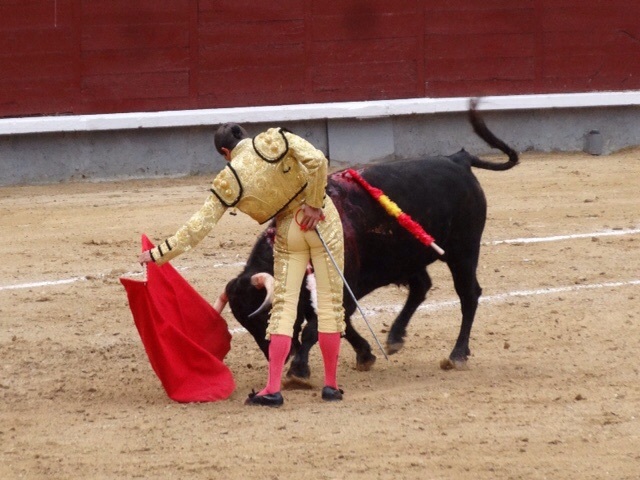 In that case, there is the Descabello, which is a shorter sword that is used to sever the bull’s spinal cord, which kills the bull almost instantly. It is brutal, but it doesn’t last very long and I wonder how many animals suffer for just as long, or even longer at modern slaughter houses or when they are wounded when hunted? The bulls have a very good life up to the time they enter the bull ring, and then a half hour later it is all over, or maybe I am just trying to justify the experience? 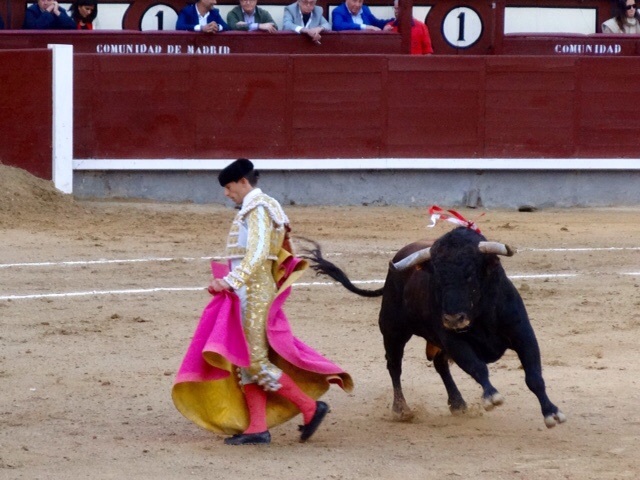 I tell Bob that something is going to happen, the air feels absolutely electric, and sure enough a minute or so later the bull tosses the matador into the air. 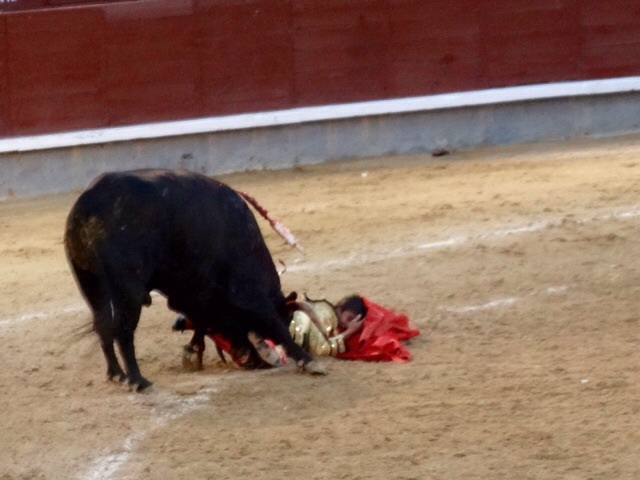 He is pinned to the ground and it takes what seems like a long time for help to arrive and distract the bull. The pictures are blurry but maybe that is for the best. 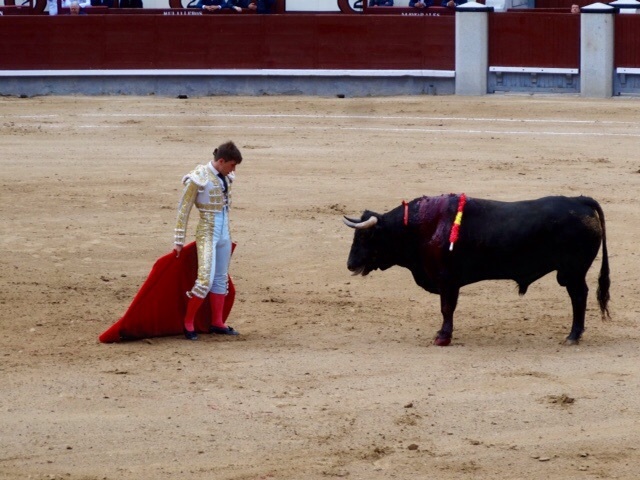 Amazingly, this young man gets to his feet and continues the fight, even defiantly turning his back on the very bull that just tried to kill him! These men are either very brave or very crazy! This was the last fight of the night, the arena empties quickly and we head for home. It was almost ten by the time we got home and have some soup before bed. We have to find a way to avoid these late night suppers!